Having surgery to treat a medical condition or an injury is far from the end of your treatment. Post-surgery, it is vital that you properly care for the surgical wound to ensure that you recover quickly, avoid complications, and prevent an infection. If you’ve never cared for a surgical wound before, here are a few things that you should know about how to do so properly. First and foremost, it is important that you follow any and all instructions your doctor gives you regarding care of the wound. The other tips mentioned in this article are general best practices; however, the exact care procedure for your surgical site will depend on the type of surgery you had. So, it is always best to follow all of your doctor’s instructions in this matter. And, if you have any questions regarding care of the wound, call your doctor’s office to speak to a nurse. Most surgical wounds will require a bandage of some sort for the first few days; your doctor will provide you with exact instructions on when this bandage can be removed. Beyond that point, it is usually okay to go without a bandage. However, that’s not necessarily the best idea. Keeping the wound covered can protect it from accidental injury and may help it to heal faster. So, it could be a good idea to keep the area bandaged for a while longer. If you do decide to keep a bandage on the wound, be sure to change it every day, or if the bandage becomes dirty in any way. These types of sterilizers can damage the tender, healing skin in the wound and can delay healing. Plus, it will sting a whole lot more than warm water mixed with a gentle soap. Also, avoid applying any creams or lotions unless your doctor has told you it’s okay. Your doctor may also tell you to flush out the wound. In these cases, you will still want to use a mild soapy water, or possibly salt water, in a syringe. You should get more specific details on how to do this from your doctor. After you’ve finished cleaning the wound, be sure to gently pat it dry with a piece of clean gauze or a clean cloth. It is usually best to keep your surgical site completely dry for the first 24 hours, so avoid showering for the first day following your surgery. If you are desperate to wash yourself, a sponge bath is typically okay, as long as you keep the surgical wound completely dry. After the 24 hours have passed (and you’ve gotten approval from your doctor) it is usually better to shower than it is to bathe. This is because immersing your surgical site in a bath will soak the wound and can cause it to soften, which may lead to it reopening. If your wound is in an area that you can elevate out of the water—such as an arm or a leg, you can take a bath so long as you don’t soak the surgical wound. You may also want to ask your doctor whether or not you should apply a waterproof dressing before showering or bathing, to give the wound some extra protection. As you begin healing and start returning to more normal activities, you may find yourself spending more time outdoors. If your surgical wound is on a part of your body that is exposed to the sun, you should cover it with tape or apply sunscreen (assuming the wound is healed enough for this). Too much sun exposure on a healing wound can cause the scar to darken and be much more noticeable. You’ll want to take extra care to protect the wound from sunburn for a full six months after your surgery. By properly caring for your wound, you can help it to heal more quickly, as well as reducing some of your own discomfort during recovery. 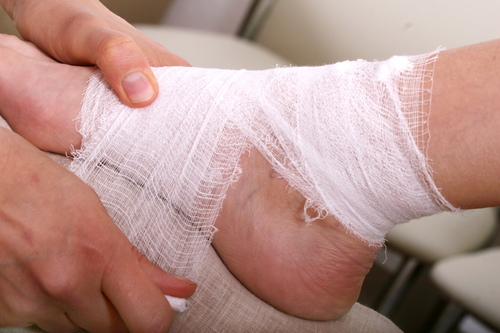 If you are in need of any wound care supplies, be sure to stop by one of our many convenient locations to pick up gauze, waterproof dressings, surgical tape, and other important supplies for proper wound care.